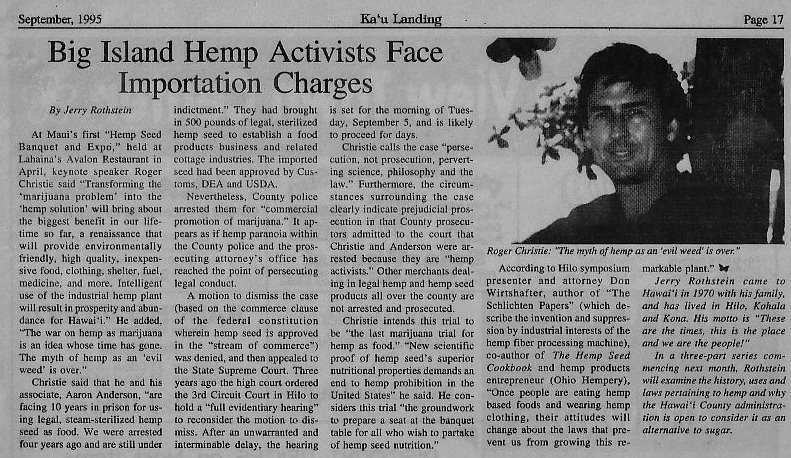 Big Island Hemp Activists Face Important Charges. - "They had brought in 500 pounds of legal, sterilized hemp seed to establish a food products business and related cottage industries. The imported seed had been approved by Customs, DEA and USDA. Nevertheless, County police arrested them for "commerical promotoion of marijuana.". "It appears as if hemp paranoia within the County police and prosecuting attorney's office has reaced the point of persecuting legal conduct."